It’s been a while since I made anything with matcha and when CT bought me a tin of it for my birthday I reckoned it was time to do more than just drink it. 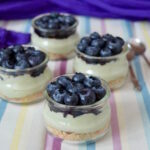 This easy recipe for matcha green tea cheesecake pots with blueberries popped into my head and before I quite knew what I was about, they were made. When there’s a heatwave on, who wants to spend hours in the kitchen slaving over a hot stove? Not me for sure. 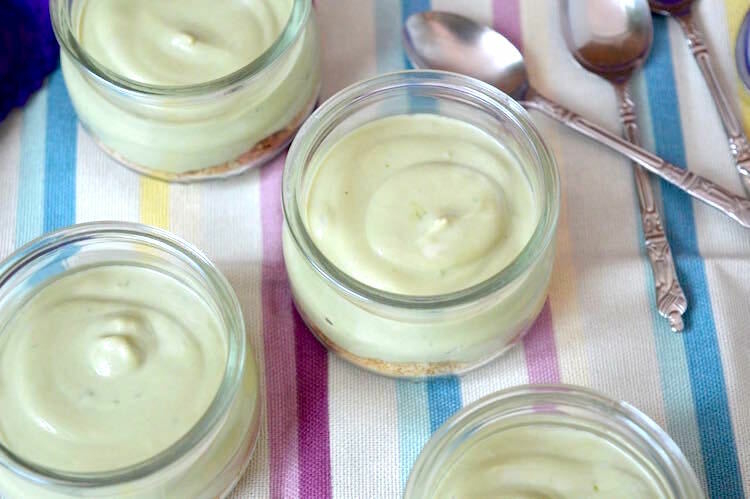 These matcha green tea cheesecake pots are quick and easy to put together. They’re even simpler if you don’t include the blueberries. 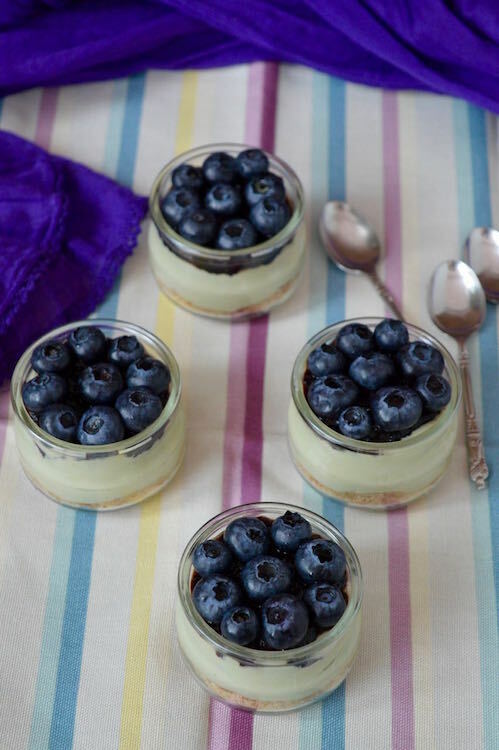 The berries do add colour and contrast in both flavours and texture though, so it’s worth a bit of extra effort. It’s always useful to have something you can make in advance too. These will keep in the fridge for a couple of days, though they are best eaten the same day they’re prepared. All you need to do is crush a few digestive biscuits, whip up some cream, zest and juice a lime and then do some stirring. The rest is just an assembly job. In this heat, it’s about all I can manage. Simple as they are though, these pots make an impressive summer dessert and are great for alfresco eating or to finish off dinner with friends. If you don’t fancy blueberries, you could use raspberries with raspberry jam or strawberries with my easy homemade strawberry jam. So why are these matcha green tea cheesecake pots healthier than you might think? They contain matcha green tea of course. Matcha is loaded with antioxidants, specifically catechin, which is said to be one of the best for fighting cancer. Blueberries are great for a whole host of minerals, vitamins and antioxidants. I’m always trying to get CT to eat more bilberries and blueberries as he has glaucoma in the family and blueberries are said to help prevent it. The cheese used is quark. Quark is a fermented low fat fresh cheese that is particularly loved by Slimming world. I did add some double cream for richness to the mix, but the amount is relatively small. The digestive biscuit base is just crumbed with no added butter, as is usually the case with cheesecakes, so less saturated fat. I added some sugar to the cheesecake mix, but only a small amount and the wild blueberry jam I used was a no-suger jam. The pots are small, but perfectly satisfying. A quick and easy dessert that has several layers of flavour and texture making it seem more impressive than it is. It's healthier than you might think too. Whip the double cream. It won't take long with a hand whisk for this small amount. Grate the lime zest into the cheese and sieve in the matcha. Add the sugar and beat until everything is well combined. Stir in the cream. Divide the crushed digestives between four small pots. Press down with the back of a spoon. Spoon the cheese mixture on top, followed by the jam. Place the blueberries on top and refrigerate for 30 minutes or so to firm up. Will keep in the fridge for a couple of days. If you make this recipe for matcha green tea cheesecake pots, I’d love to hear about it or see a photo. For more nutritious and delicious recipes, follow me on Twitter, Facebook, Instagram or Pinterest. I’m sharing these matcha green tea cheesecake pots with #CookBlogShare hosted by Lost in Food. 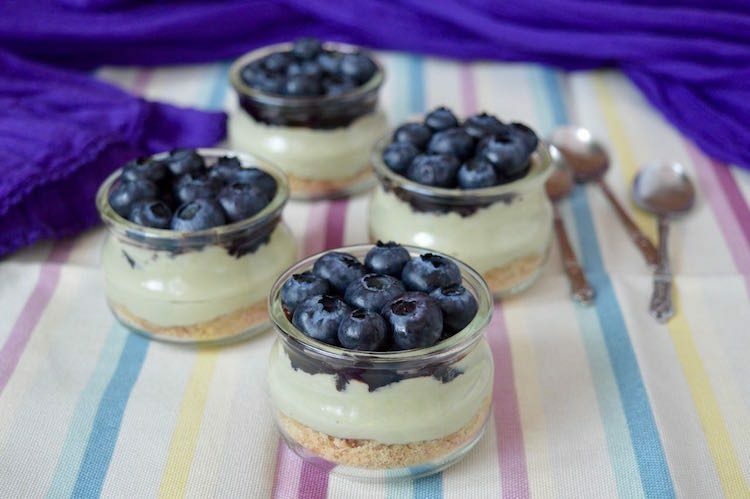 Matcha Green Tea Cheesecake Pots. PIN IT. They are indeed quite healthy..I think they are even great for breakfast, esp. when the weather is so darn hot! Oh Angie yes, the weather has been exceedingly hot. Luckily, we’re finally having a bit of rain and cloud and it’s very welcome indeed. I adore matcha, and love the combination with blueberries, such a lovely flavour profile. And yes, so good for you! 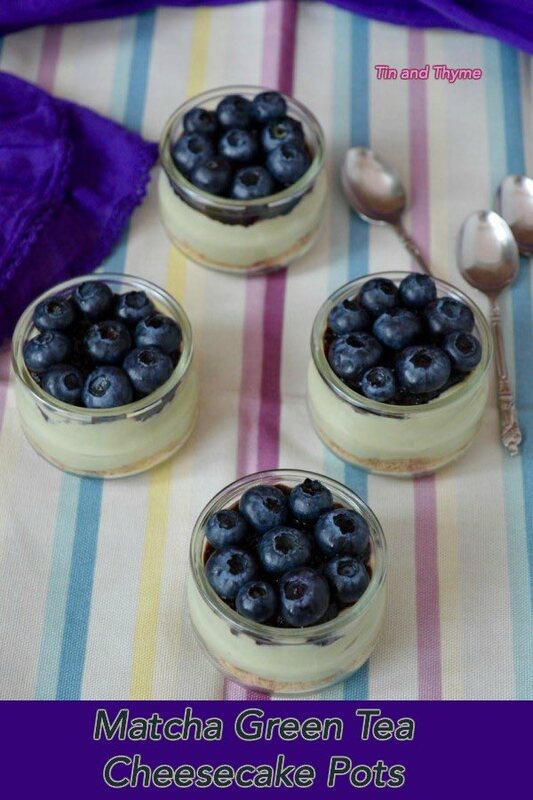 I bet these taste so light and refreshing, perfect summer dessert! I really should use quark more often. I’ve never used Quark in cheesecake before. I’m delighted to know it works. Now I have to try this recipe. Thanks Anca. I thought it worked really well, especially for a quick and relatively healthy dessert.